There's certainly a big advantage to sticking with the big online casino brands. Here's a perfect example: there's nearly a quarter million dollars in casino bonuses being given away by Intertops Casino this winter. 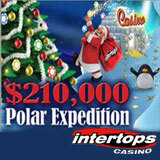 During the Polar Expedition casino bonuses event hundreds of players will receive a total of $30,000 in weekly casino bonuses. You'll automatically earn scoreboard points when you play for real money at Intertops Casino. Every week, the top 20 players each get a $500 bonus and another ten get $300. Play a lot and you could be one of the 300 players that get bonuses up to $500 every week. Amongst their hundreds of games from Realtime Gaming, you'll find some great Christmas slots like the new The Naughty List and classics like the Rudolph series Rudolph’s Revenge, Return of the Rudolph, Santa Strikes Back and The Elf Wars.